One of the challenges of treating vascular lesions is the inherent variety in the size and depth of the blood vessels. Successfully treating vascular lesions require destruction of these blood vessels while dealing with these challenges. The MaxG™ Optimized Light™ handpiece from Palomar offers an excellent solution with customized features such as Dynamic Spectrum ShiftingSM , dual-band filters and Smooth PulseSM technology - which provide more uniform heating across the entire diameter of larger vessels and increased client comfort. And now the 4mm Small Spot Adaptor accessory is available for treating small vessels on darker skin types. The MaxG Optimized Light handpiece offers superior vessel and pigment clearance that rivals single-wavelength lasers in performance. Click below to view a comparison study that reveals how Optimized Light measures up to the competition, Pulsed Dye Laser. Modeling of blood vessel coagulation with single pulses of pulsed dye laser (left) and MaxG (right) based on ex vivo data. Coagulation is indicated by red or brown shading. The MaxG handpiece offers superior closure of the larger, deeper facial vessels with Dynamic Spectrum Shifting - which increases the concentration of near-infrared light with longer pulsewidths to provide more uniform heating across the entire diameter of larger vessels. 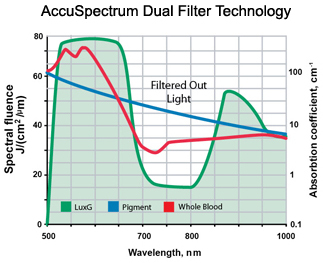 AccuSpectrumSM: Dual bands of wavelengths selectively target the absorption peaks at hemoglobin and preferentially heat blood in the presense of melanin. Smooth Pulse: Proprietary light delivery system that allows for the usage of greater amounts of light energy while minimizing rise in skin temperature. New Optimized Light Source for Treatment of Vascular Lesions of the Skin Ross, V., Tanghetti, E., Vasily, D., Weiss, R., Childs, J., Erofeev, A., Smirnov, M., Altshuler, G., PMTI, 2010. "We report on an optimized pulsed light source (MaxG) for the treatment of vascular and pigmented lesions of the skin. A discussion of the technical characteristics and early clinical findings are included." Optimum Spectrum and Pulse Shape for Vascular Lesion Treatment: The Science Behind MaxG Childs J., Erofeev A., Smirnov M., Altshuler G., PMTI, 2010. "The new arc lamp-based Palomar MaxG handpiece is designed for the treatment of vascular lesions and pigmented lesions in Fitzpatrick skin types I-IV."